For purposes of comparison, the pictures show the miniature reproduction in comparison to the original and then a closeup of the reproduction. The quarter is included for scale. As far as we know, this book has not been reproduced in full size. 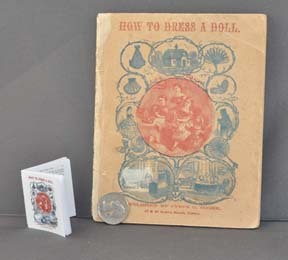 The content of the book is a collection of various bits of instructions for both clothing and making small items to accompany a doll that had appeared in magazine and other publications. The original lacks a copyright certification but the contents consist of exerpts from an 1860 book first printed in London. Like the original, it is stitch bound and, with the exception of the front page, printed completely in black and white. 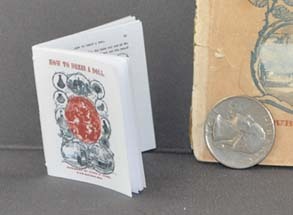 And, although a full-size reproduction hasn't been printed, despite this version being only about 1 1/2 inches tall, if your eyes are good or you use a magnifying glass, you can read the text of the book!